The thank-you epidemic used a very unique digital marketing campaign, not only aimed to advertise to consumer, but also asked for consumer help in order to get their brand’s products stocked in the 2 supermarket giants Coles and Woolworths. I know a lot of you are thinking, what is the thank-you brand? But if you think hard and rack your brain you will probably remembers seeing their water bottles around. The Thank-you social enterprise also produces muesli bars, cereal and a range of body care products with every thank-you product sold helping to raise funds for projects in developing countries able to provide the necessities such as food, water and hygiene training to people in need. 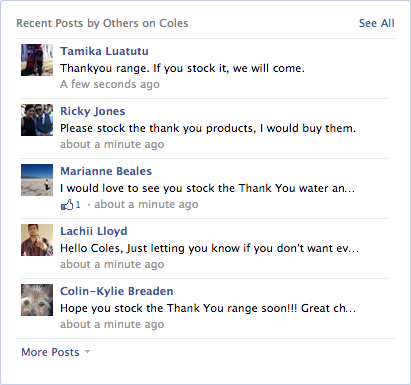 While the Thank-you products were stocked at convince stores around the country, they faced one major issue of not having enough reach and shelf space with Coles and Woolworths not stocking their brand. This was a major concern as together Coles and Woolworths accounted for more than 70% of grocery bottled water sales in Australia. To over come this issue, like a lot of companies today, they turned to social media for the answer creating the ‘ Coles and Woolworths campaign’. This creative campaign is able to exemplify the value of consumer feedback and 2-way communication, letting consumer have a say. Consumer are powerful, especially when they are not satisfied shown by their engagement in the Thank-you campaign, while also exploring the impact and important use of social media in marketing today due to its ability to link consumers and brands. I think this is a smart and cost saving way to penetrate the supermarket giant’s, while also utilising the current trend of social media. This is one the of most interesting examples of digitalmarketing i have come across so far, getting the consumer involved, simple yet effective. What are your thoughts? Like it? Could this be a new way of advertising, asking consumer to do the work? Or even a way to penetrate and get products stocked by huge distributors? I know, very clever and cost saving strategy i thought! I think with more brands popping up here and there we may see a lot more of this type of marketing, allowing the consumers to have a say and get involved. ← Carlton Football Club, a brand?